Mounting the chuck on the spindle can be a bit tricky since the nuts must be inserted and started onto the chuck mounting studs in the narrow space between the back of the spindle plate and the front of the headstock casting. I'm not a big guy (well, not very tall, anyway) but my fingers barely fit in this space. 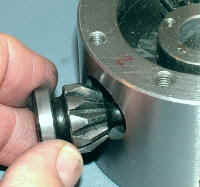 The technique I use is to hold the nut between the tips of my two index fingers while holding the chuck onto the spindle with the thumb and other fingers of my right hand. 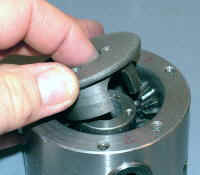 I then use the tips of my fingers to spin the nut a little to get it started on the stud. The photo below shows the "staging area" Paul recommends. It really does make it easier to get the nuts started on the thread. The white dots marked on the spindle and the chuck help me to quickly orient the chuck with the studs. 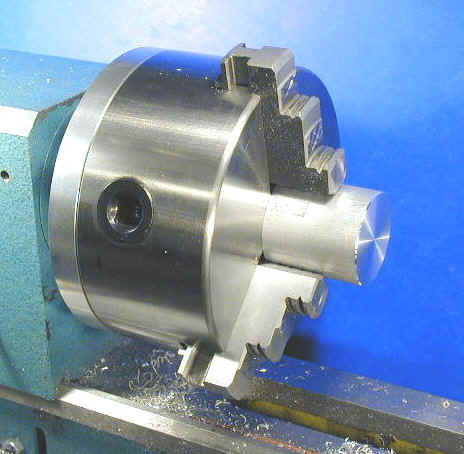 I use white dots for the 3-jaw chuck and red dots for the 4-jaw chuck; the two chucks use a different set of holes in the spindle, so the dots immediately get the chuck oriented with the right holes. 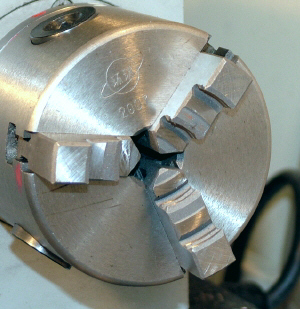 There's one spindle hole that's shared by both the 3-jaw and the 4-jaw chuck, so it has both white and red dots. Here is a tip I haven't seen on this group yet. I noticed some people seem to complain about getting the nuts on the studs for mounting the 3 and 4 jaw chuck. Bend the tip of a small wire to 90 degrees and hang the nut on it. You can then place the nut at the end of the stud and use a finger or screwdriver to spin the nut until it starts to screw onto the stud. The end of the wire the nut sits on should be parallel to the stud. It gets easier after some practice. I cut the short arm of a hex wrench shorter, so it would fit between the headstock casting and the studs, so I could hold the set screws the manufacturer used for studs, and keep them from screwing into the chuck when I tried to tighten the nuts. I use the same hex wrench to start the nuts. It works great, and costs very little. HF sells cheap hex wrenches. To remove the nuts, I first loosen them with the open-end wrench that comes with the lathe, then grasp the chuck in my right hand to keep it from dropping onto the ways, and then spin the nuts off using my thumb. 3-jaw chucks come with two sets of jaws called inside and outside jaws. Inside jaws are so-called because they can grip the inside surface of a cylinder or a ring. 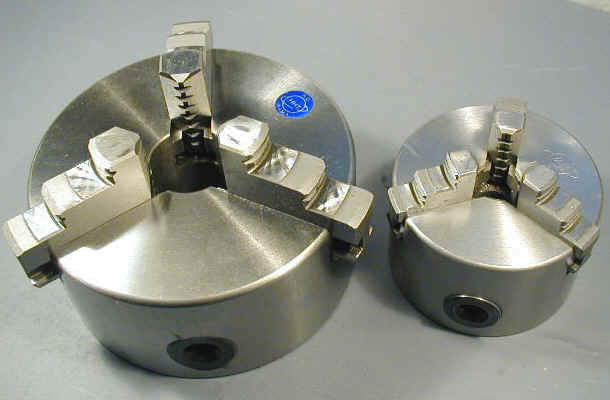 As the jaws are opened, they expand until they hold the cylinder tightly. For most work, however, the jaws are closed down to grip the outer surface of the workpiece. 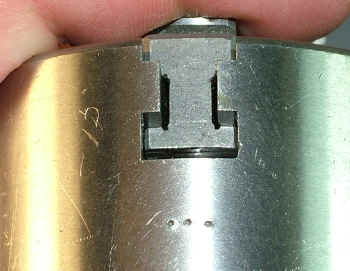 Because of this dual capability, inside jaws are used more often than outside jaws. 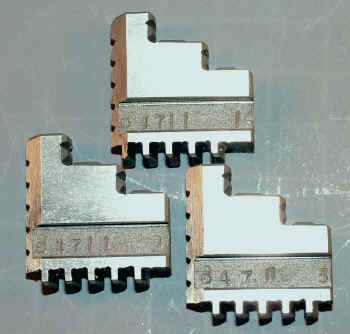 4-jaw chucks come with only one set of jaws, but they are reversible to achieve a similar effect. On most 4-jaw chucks, each jaw moves independently of the other jaws, so the chuck is called an independent 4-jaw chuck. You may need to remove the chuck jaws before using the chuck in order to clean out the packing grease in which they normally are shipped. Even if your chuck arrives clean, eventually you may need to remove the jaws to clear out accumulated chips or to switch between the inside and outside jaws. 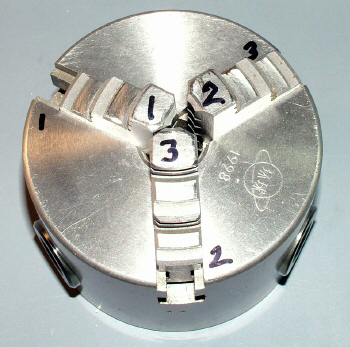 The jaws on 3-jaw chucks are numbered and must be reinstalled in the correct sequence. 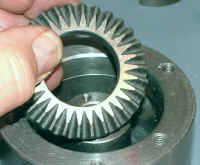 If the jaws are installed out of sequence, the tips of the jaws will not meet at the center of the chuck, as shown in the photo below. If you encounter this problem, simply remove the jaws and re-insert them in the proper sequence. When you remove the jaws for the first time it's a good idea to mark the slot from which each jaw is removed so that they can be reinstalled in the same slot that they came from. 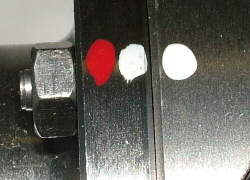 On my chucks I use a hardened punch to mark the slots with 1, 2 or 3 dots. On some chucks, the slots in the chuck are individually numbered. 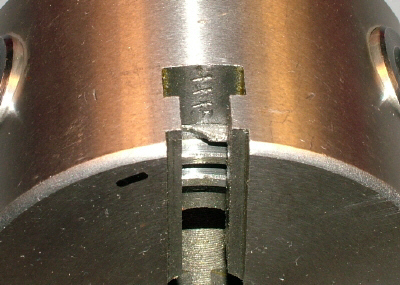 On other chucks, the chuck serial number is stamped in slot #1 and slots #2 and #3 follow in counter-clockwise sequence when looking at the front of the chuck. If you look at the channel on the side of each jaw you'll see that the jaws are numbered 1, 2 and 3. On some chucks the numbers are stamped, before the jaws are hardened, while on others they're written using a vibrating diamond scriber. Usually the numbers are difficult to see clearly, so a bright light skimming the surface is helpful. In the photo below, the jaw numbers are at the left end of the channel, followed by a letter B, followed by the chuck serial number 1115. Note that the 1 looks like a straight line. I don't know what the letter B means. During manufacturing, the jaws are ground to fit a specific chuck, so are not interchangeable with other chucks of the same size. This is important to keep in mind if, like me, you happen to have more than one 3" 3-jaw chuck in the shop. 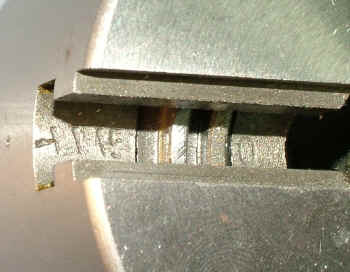 On the jaws below, from a different 3-inch, 3-jaw chuck, the letter B appears first, followed by the serial number, 4711, followed by the jaw number. In the next photo, the numbers have been engraved using a vibrating diamond tool. 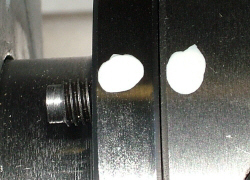 These are the outside jaws from the same chuck (# 4711) as the inside jaws in the photo above. If you remove the jaws from the chuck and stand them up on end next to each other you can see that the teeth are staggered. Looking at the front of the chuck with the jaws removed, you can see the scroll thread that engages the jaw teeth. If you slowly turn the chuck key in one of the key holes, you can see the leading edge of the chuck scroll pass by the slot for the jaw. This leading edge of the scroll must engage with the first tooth of each jaw in turn, in the correct sequence, to properly reseat the jaws. 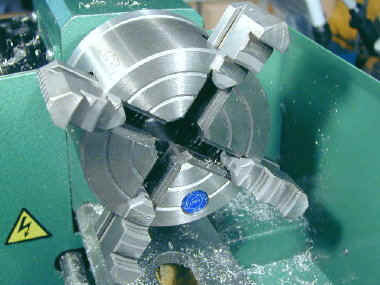 If the jaws are installed out of sequence, the tips of the jaws will not meet at the center of the chuck. As long as the jaws are installed in the sequence 1, 2, 3 they will meet in the middle. However, depending on which slot you start with, there actually are three different configurations that could be chosen. For optimum alignment of the jaws, it is best to install the jaws in the slots in which they originally were shippped. Installing the jaws is easiest with the chuck mounted on the spindle so that each slot can be rotated to a convenient working postition to insert the corresponding jaw. Back off the scroll thread in a clockwise direction until it is just to the right of the jaw slot #1. Press jaw #1 into the slot until it stops against the scroll. Now, while pressing down on the jaw with your thumb, turn the chuck key clockwise to advance the scroll counterclockwise to engage the scroll with the first tooth of the jaw. Continue until the leading edge of the scroll is just to the right of the second slot. Insert jaw #2 and repeat for jaw #3. 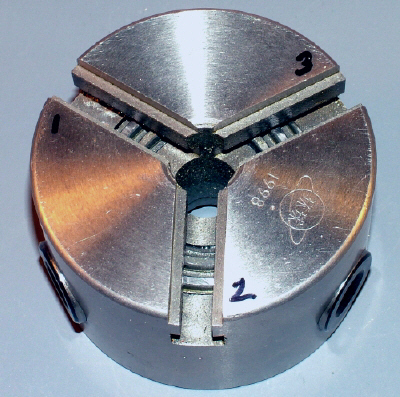 If you got it right, all 3 jaws should meet evenly in the middle of the chuck if you crank them all the way in. As with other parts of the lathe, you can often improve the smoothness of operation of your chuck by taking it apart, cleaning it thoroughly and lubricating the internal moving parts. Although I don't believe it's critical, you may want to number the similar parts with a Sharpie pen before removing them so that you can re-install them in the same locations that they came from. With the chuck broken down, you may want to lubricate the moving parts with a small amount of motor oil or light machine oil. Keep in mind, though, that when you spin the chuck up to speed on the lathe, any excess oil will be thrown out from the chuck by centrifugal force, so be prepared for this and spin it up slowly. Reverse the above steps to reassemble. Here again, you may need to tap on the back of the scroll plate to get it seated in place. Be sure to replace the jaws in the proper sequence as described in the preceding section above. 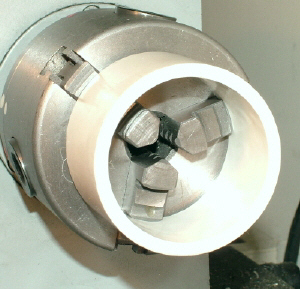 A variety of small chucks can easily be adapted to fit on the 7x10 spindle plate. At least one, the 3" 4-jaw, mounts directly on the versions of the lathe that have 6 mounting holes in the spindle. See the Lathe Versions page for more info on this feature. Check out Ty Hoeffer's chuck comparison. A question that comes up frequently on the 7x10 interest group is "What's the largest chuck I can use on the 7x10". For quite some time, I was of the opinion that a 4" chuck was the largest, but early in 2003 I acquired a 5" 3-jaw import chuck from J&L Industrial. I have been using this chuck for some time now and have been very satisfied with it. Read my product review to learn more. Here are the chucks I use on my lathe. Note that the 4" chucks are considerably more massive than the 3" chucks. My three add-on chucks all have the same manufacturer's logo. The stock 3-jaw lacks the blue emblem, but appears to be the same planetary symbol in Japanese. The optional chucks seem to be equal in quality to the stock chuck. Warning: Use the maximum capacity figures only as a planning guideline. may not be correct for chucks of the same size made by other manufacturers. of the scroll holding the chuck jaws in place at the maximum opening. Note that the hole through the lathe spindle is 3/4" #3 Morse Taper. Varmint Al determined that this could be safely reamed out to 13/16" (.8125) and generously offered his reamer to anyone on the 7x10 group who wanted to perform this modification. Not only does it enlarge the hole, but it removes any rough edges and eccentricities from the spindle bore. The reamer has been passed by U.S. mail from user to user for several years now. Check the Files section of the 7x10 group and you will find information on how to get on the list. 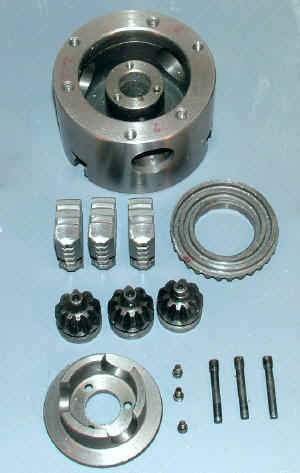 Many users have purchased a 3" 4-jaw chuck from J&L Industrial (P/N PCC-19500-A). Harbor Freight now sells a version of this chuck, SKU #43581 which I believe is the same as the one sold by J&L, but at the more attractive price of $49.95. 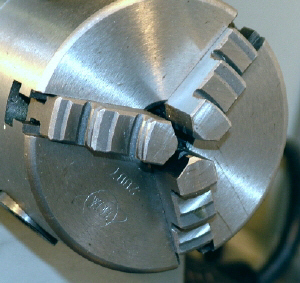 The 4-jaw chuck is an almost essential accessory. LMS also offers this chuck, item 1175, for $64.00. If you need it in a hurry, LMS is likely to get it to you more quickly than HF. 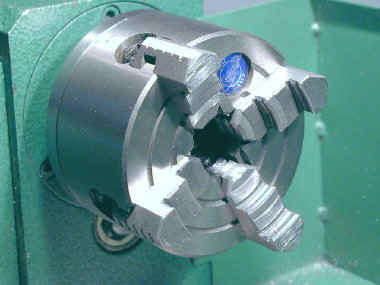 On all of the newer models of the lathe, additional holes in the spindle plate allow this chuck to be mounted directly. 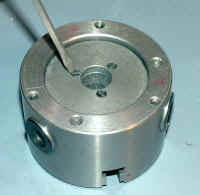 It also has a recess which mates precisely with the raised ledge on the spindle plate. You will need 4 6mm x 25mm studs to mount the chuck. I bought some stainless Phillips head screws from Small Parts, Inc. and turned the heads off for this purpose. 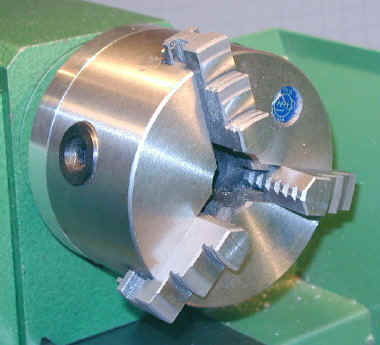 Automatic centering of the stock is a feature of the 3-jaw chuck not shared by the 4-jaw. Instead you get the ability to center the workpiece as precisely as your measuring tools and patience permit. That, plus being able to chuck rectangular and other non-cylindrical shapes, make the 4-jaw chuck a tremendous addition to your tool holster. Some lathe aficionados who value precision and flexibility over speed and convenience prefer the 4-jaw over the 3-jaw for everyday work. 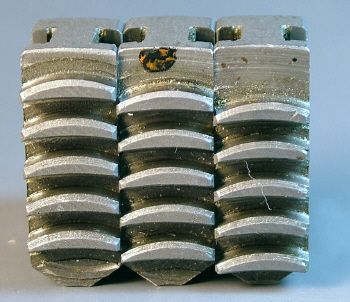 For more information, see my 4-jaw chuck page. 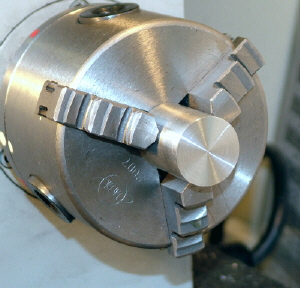 Using a dial indicator, you can center a workpiece in a 4-jaw chuck to less than .0005" accuracy. It takes a little time until you get used to it, but if you need precision alignment this is the way to go. Of course the 4-jaw chuck will hold rectangular and odd-shaped work that won't fit in the 3-jaw chuck. It comes as surprise to many, that you can actually make a cube in a lathe using a 4-jaw chuck. Another useful chuck is the 4" 3-jaw. It is similar to the standard 3" chuck but will hold larger stock (although not as large as the 3" 4-jaw). I bought mine on sale from J&L (PCC-04000-K) for about $40. Unfortunately, this chuck does not mount directly on the lathe spindle so you have to make an adapter backing plate (visible in the picture). 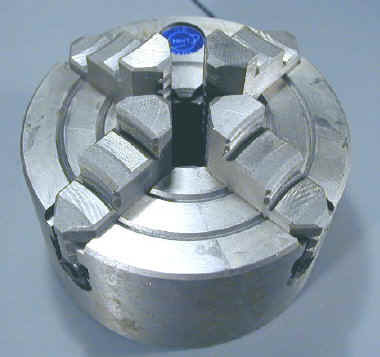 LMS now offers a version of this chuck, item 1698. 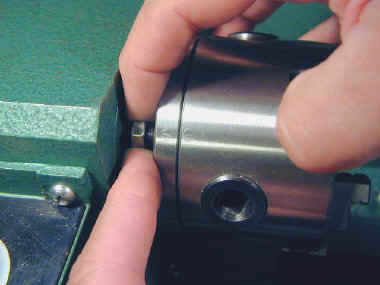 The backing plate must be very precisely machined to ensure minimum runout. I found this to be a demanding and time-consuming task, but a rewarding and educational one as well. 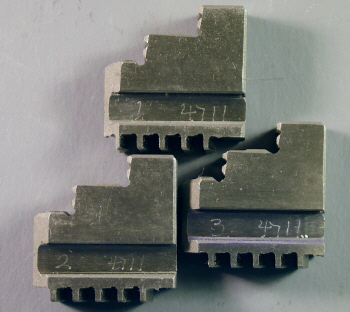 Check Ty Hoeffer's site and the 7x10 group for info on making an adapter plate. 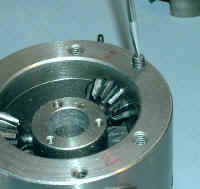 5-inch 3-jaw chuck mounted on a back plate. For quite some time I held the opinion that a 4" chuck was the largest that could effectively be used on the 7x mini lathes. My view on this changed when I saw reports from Fozzybear and others on the 7x interest group that they were using 5" chucks. Naturally, I had to try this out on my own lathe. At 5kg, it is somewhat massive for this little lathe, but it works well and makes it possible to hold larger stock than either the 3" or 4" chucks. The chuck through-hole is over an inch in diameter (about 1 1/8") but the largest stock that will fit through the lathe spindle is 3/4". Still, this lets you get a secure grip on a piece of 1" stock using the full length of the chuck jaws. The only real disadvantages that I have found are that the extra mass means that it takes longer to spin up to speed and to slow down and is potentially more dangerous than the smaller chucks due to its larger size and mass. If you are new to lathe work, I definitely recommend that you get at least a few months experience using the stock 3" chuck before you move up to a larger chuck. 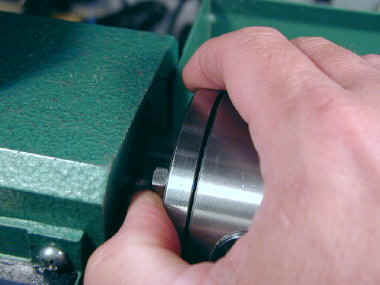 With any chuck larger than 3" diameter you will need a back plate to mount it to the lathe spindle. 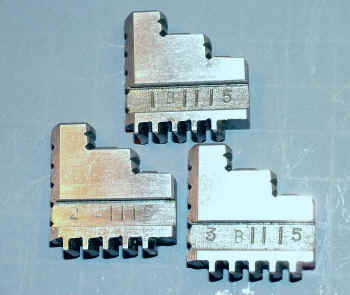 LMS sells back plates for the 4" chucks, but I have not seen one for the 5" chucks. You can make your own by following the procedures on my chuck back plate page, but scaling the dimensions for the 5" chuck. For more information on this chuck, and making a back plate for it, see my 5" chuck review. 5" chuck shown beside stock 3" chuck. I bought my 5" chuck from J&L Industrial on sale for $63.35 (P/N PCC-05000E, $84.53 as of 12/03). It is made by the same manufacturer as the others, with the blue planet logo. Enco also sells an import 5" chuck (P/N 270-4074, $67.95 as of 12/03) for about $60 on their sale flyers. Hank Newton sent me a photo of his Enco chuck, shown below. It looks similar to the J&L version. I bought this chuck in 12/00 from Grizzly (P/N G1038, 114.95). It works well on the minilathe but you will have to make an adapter plate to mount it. This chuck has the same blue circle planetary vendor logo as the 3" 4-jaw from J&L and is clearly from the same manufacturer. Unfortunately, it appears that this item may have been discontinued by Grizzly. On my invoice it is identified as "*DISC* CHUCK" and I can no longer find it on their website. However, the same chuck may be available from J&L or other vendors. LMS now has this chuck, item 1588. This is the largest chuck I feel comfortable recommending for the minilathe and is probably about as large a chuck as you can effectively use in any case. 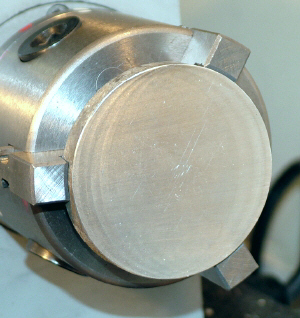 You can hold work up to 5" in diameter in this chuck and, if you try working on a piece of this size, you will find that the torque of the lathe and ability to move the tool back far enough become the limiting factors. Well, I've since become convinced that a 5" chuck can be used on the minilathe. Check out my review for more info. If you purchase a 4-jaw chuck of this size you could get by without the 3" 4-jaw. If you can only afford one or the other, this one will give you more versatility. On the other hand, you must make a backing plate to mount this chuck while the 3" version mounts directly to the minilathe spindle plate (on the ones that have 6 mounting holes).